Ever wonder why some of your emails are NOT getting delivered? More often than not, your emails are getting rejected by the spam filter. 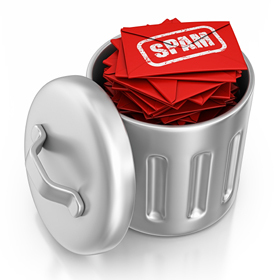 How do you avoid the spam filters? First, an understanding of how a spam filter works is needed. An email spam filter follows a long list of criteria that judges whether an email is spam or not. It scores your email by looking for certain phrases, characters, and symbols. The filter will check both the email’s subject line and the body of the email. Each time a spam key is triggered, it is assigned a certain point value. The more points you get, the less likely your email is to get through. Each ISP has a certain threshold of points for allowing emails to their users. Once you exceed the limit, you are not getting in. Here is a list of sample criteria and point values from http://spamassassin.apache.org/. In order to help you get through to the inbox, each email template used should be run through a spam score checker. The spam score checker will allow you to see if your email is regarded as spam. A score of 5 or less is ideal. However, a score under 10 is still acceptable. Keeping your spam score low is the best way to reach the inbox and insure delivery of every email. Contact one of our email marketing experts to discover the best solutions for your email marketing campaigns at our toll free number 888-497-7898.